Hi, it’s Holly. I have 5 types of butter in my fridge at any given time and I carry sea salt in my wallet. 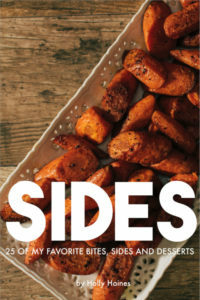 25 of my favorite bites, sides and desserts, including vegetarian, gluten-free and dairy-free options! 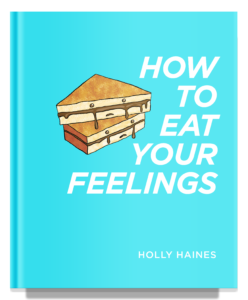 A cookbook about feelings, and how I like them prepared. From My Impossibly Tiny Kitchen: My blog dedicated to keeping my creative recipe writing juices flowing, all from an 8’x8′ kitchen. From blackened shrimp stuffed deviled eggs to chipotle turkey chili, you’ll find my quick and easy recipes on my YouTube channel @ itshollytv. Grammy-themed food puns? Flaming hot Cheetoes pancakes?? The ladies over at Clevver keep me on my toes! There aren’t many foods that I don’t like. Except bell peppers. All of them. The red ones, the green ones, yellow ones, roasted, baked, stuffed. You probably won’t find them in any of my recipes (gumbo being the exception). Other than that, all foods are fair game. I appeared on Season 2 of NBC’s Food Fighters (episode 2! ), competing against 5 (FIVE!!) professional chefs, including Eric Greenspan! I was a Top 100 finalist for MasterChef Season 6 on Fox, out of 40,000 people. I like my desserts more salty than sweet. My favorite city on earth is Paris.